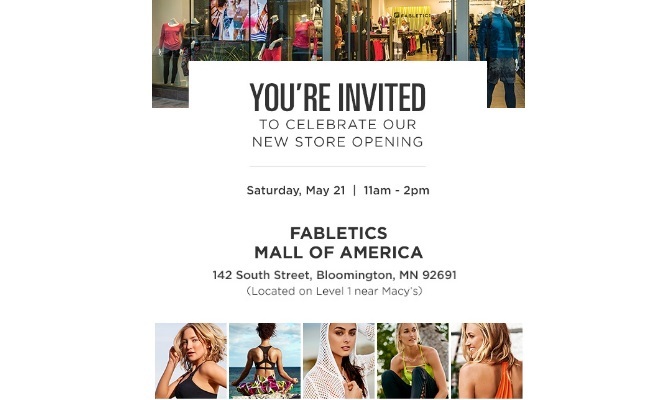 Mall of America® announced today that Fabletics, the fashion athletic wear brand co-founded by award-winning actress Kate Hudson, will open a 2,000-square-foot store at the Mall later this spring. The Fabletics store will also carry FL2, its new line of men’s high performance athletic gear and perfected lifestyle basics. “Our retail expansion has been an incredible journey – I’ve loved being able to connect with customers at our stores. I’m so excited to be bringing our next location to the Mall of America,” said Hudson. Launched in 2013, Fabletics offers premium fashion-forward activewear for women. Designed to transition from the gym to real life, Fabletics features a range of performance-enhancing pieces for running, yoga, and the gym, to stylish fashion pieces and ultra-cozy loungewear. Every style is designed for working out and going out, with outfits starting at $49.95 for a top and a bottom. Fabletics and FL2 offers high performance and high-style activewear – without the high cost. “The fashion-forward line, accessible price point and versatility of the pieces all make Fabletics a natural fit for our retail mix,” said Heather Brechbill Swilley, VP of Leasing at Mall of America. The Fabletics boutique will be located on Level 1, South. For more information on the more than 520 stores at Mall of America, click here. Mall of America (MOA) is the largest retail and entertainment complex in North America. At 5.6 million square feet, MOA is home to more than 520 world-class shops; Nickelodeon Universe, the nation’s largest indoor family theme park; SEA LIFE Minnesota Aquarium, a 1.3 million gallon walk-through aquarium; Hard Rock Café; Moose Mountain Adventure Golf; Theatres at Mall of America, a 14-screen movie theater with digital projection including 4K, digital sound and 3D capabilities; Radisson Blu Mall of America, a 500-room hotel connected by skyway to Mall of America. The Mall opened in August of 1992 and is located in Bloomington, Minn., just minutes from downtown Minneapolis and St. Paul. The Mall is currently undergoing a $325 million expansion project on all three levels on the north side. The expansion will include a 342-room JW Marriott hotel, office tower, high-end retailers, new dining options, a tourist welcome center and large event space. Follow Mall of America on Facebook and Twitter or visit our blog. Fabletics is an innovative, high-quality activewear and accessories line for today’s active woman, co-founded by actress Kate Hudson and the team behind JustFab. Whether it’s your sport or your passion, FL2 is designed for the athlete, the friend, the father, the weekend referee, the little league coach. FL2 was made for all men, for every lifestyle. Our designs uphold our core principles of fit, function and style – all at great prices. Visit www.fabletics.com or www.FL2.com to learn how to become a VIP member and enjoy free shipping, easy returns and complete outfits starting at only $49.95.